Okay, so yest, these tasty little spicy and crispy pillows are as delicious as they look. They are sauteed cubes of homemade paneer, or Indian Cheese. Paneer is an ingredient in one of my favorite Indian dishes, Saag Paneer, or spinach and cheese (I'll post a recipe soon). 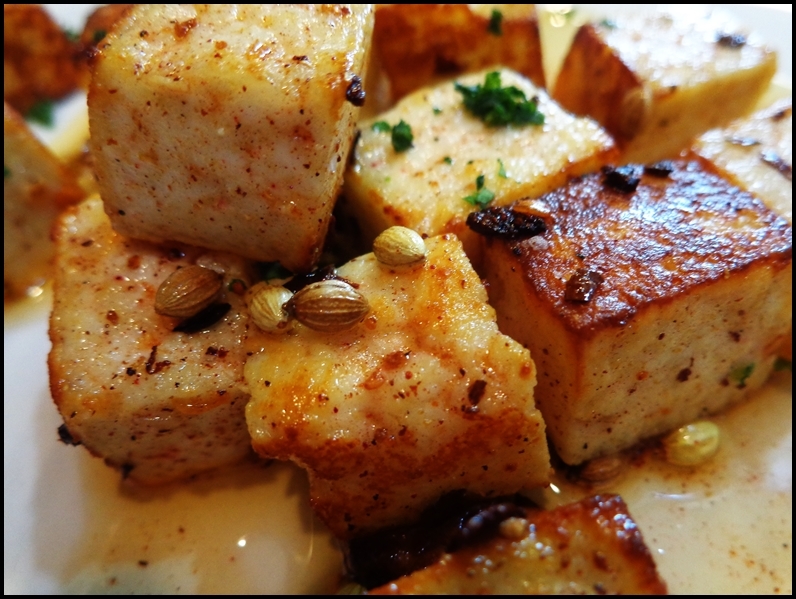 To make paneer is as easy as it gets and contains only two ingredients: milk and lemon juice (or vinegar). The recipe is below. After the paneer is set it can be sliced or diced. To make the above recipe saute the cheese in clarified butter or vegetable oil with a pinch of salt and spices (I used sea salt, a pinch of curry, whole coriander seed, crushed hot pepper, and fresh parsley. This is a great snack or side dish, and goes really good with beer. Place a double-layered cheese cloth over a colander and set aside. Heat the milk in a heavy pot over medium high heat until it just begins to boil, then stir in the lemon juice. Keep stirring the milk and it will begin to separate (the curds from the whey, just like in the nursery rhyme). After a minute large curds will form, pour it into the colander. 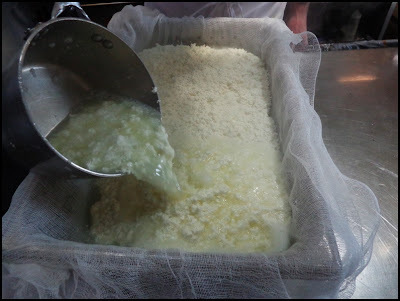 Fold the cheese cloth over the cheese and transfer it to a shallow pan; discard the whey (the liquid). place another pan on top of the cheese and weight it with a can or jar of something to press it down. Refrigerate the cheese for about an hour or until chilled and firm. Remove the cheese from the cloth, slice or dice it, and use it in any recipe calling for paneer.